" Layer>Transparency>Alpha to selection (makes a selection from the outline of your object)"
you mean, right click>layer> newlayer? Guessing English is not your first language, not a problem but try and keep to single subjects. Rather than long descriptions maybe a video, hope you can understand my British accent. Using standard Gimp tools http://www.youtube.com/watch?v=uoPiFMLLhAQ&hd=1 2 and a bit minutes. I am sure it is possible but first-things-first, Gimp same as any 'big' application has a learning curve. (Oct 1, 2014 12:45)ofnuts Wrote: It's not a problem of Linux vs Windows, it's a problem of someone who knows explaining to someone who doesn't(*). If we assume you don't know anything at all, a simple explanation takes a 2000-page book, starting with "Chapter 1: purchasing a computer". So we have to assume that you know something and aim at what we think your proficiency is. "bucket fill selection": use the "Bucket-fill" tool ( ). If there is a selection in only fills the selection. Also make sure that the right layer is selected (normally, the new layer if you didn't reselect another one) because the paint tools apply paint in the selection, on the active layer. (Oct 1, 2014 12:45)ofnuts Wrote: Chapter 1: purchasing a computer"
when i am new in something, 200 pages are not necesary IF the first ones mention the steps refering a little review of previous known things.. AND mentioning thingss clearly and by its name. at the school a teacher told me i have a weird learn process, there are kids thats takes long to learn and another that learn quickly, but usually the ones that learn quickly will suffer latter of a plateau effect. At first, with traditional methods my learning is slow, not because i dont understand, but because i stop when i find a word or a concept i am not sure at all, while other students continue and figure it out what that meanings in the run, i stop until having 100% asurance of what exactly that means. its a little bit slow at first and requires huge ammount of logic when explaining (always should be like that) but my tearcher told me... once i pass that first slow part, while mastering concepts that other "quick learning students" take for granted without being sure of its meaning... i advance at blasting speeds. "to not proceed until you are clear"
you will learn this in the run (before to flight of course) but if you are native with this condition.. you will be better. Take another little but direct and related example of what i am saying. what was my problem following this? Quote: Select the gradient-fill tool and, starting from the top-left of the selection, 'drag' the gradient quite far down-right (see the arrow in the image. i spend several minutes looking for that gradient-fill tool, i suspected what toll was this tutorial talking about.. but i didn't wanted to proceed without being in order to avoid screwing up the already done job. then the sentence continued "starting from the top-left of the selection. what is is "staring from the top-left of the selection"??? how could this be explained without any chance of being misunderstood by ANYBODY and with fewer words? "Select [BLEND TOOL], then DRAG the pointer from top-left of the selected object to the bottom right of it." Select the gradient-fill tool and, starting from the top-left of the selection, 'drag' the gradient quite far down-right (see the arrow in the image. i saw you uploaded it today! i love the way you explained it there! in the first 15 seconds i already started learning by watching how you did enable the grid lines!!!! i was about to ask that but i didn't wanted to bother that much, you guys have been very nice and patient with me, i tried to find it in google but the same i am talking, lot of illogical and unnecessarily weird descriptions there, many ones calls to writ some scrips, some command some programming... COME ON FOR A GRID LINES!? you can use the free time to WORK ! at the right... in the layes tab, i discovered that the order of the layer if the order they are protrayed in the canvas... fine..
and.. just at the right of the eye.. there is a an icon with a chain.. what is that for? i am trying to add afade mask over the pictures, i know i have to ad a mask and then to aply a nl;end tool to give it a gradient, it worked fine for the first two layers, but for the third i did the same, i added a mask [layer-mask-add layer mask > white full opacity] EXACtLY like the others BUT this time the gradient fades in white, and the gradient i want to fade from white to blue ( i want the bottom o f the picture with a blue fog over it)j it worked with the first two why not with the third? in fact the second gave me a problem, if i deselct it and select it again then i does what it must do, but with the third it does not... is this a gimp error? i hardly try tu blame my selft and no tthe program.... but somettime si just have it in forn of me, doing step by step and it does not work. i have a problem following what you says in the video, your explanation is pretty easy and simple, BUT my gimp just dont do that. that does not work in my gimp, it paints the selected layer, and since the figure is not a layer it does not work in mine. First thing, use whatever you are comfortable with. For me learning Gimp has always been playing around and trying to see what works plus bits and pieces picked up here and there. Still learning. Always learning. I do understand that this is not the way you work. Back to click and drag for fill. Sorry but answering a question with more questions. Click and drag the colour will fill a selection. Do you have a selection? Are you sure you are on a layer that includes the selection? Some layers, such as text are smaller than the canvas and might not be included in the selection. If there is no selection, the whole of the layer will be filled. You are correct in saying the figure is not a layer, it might be a selection or it might be a path that is going to a selection. Eventually it will end up on a layer. Get in control and make a new layer for that figure. 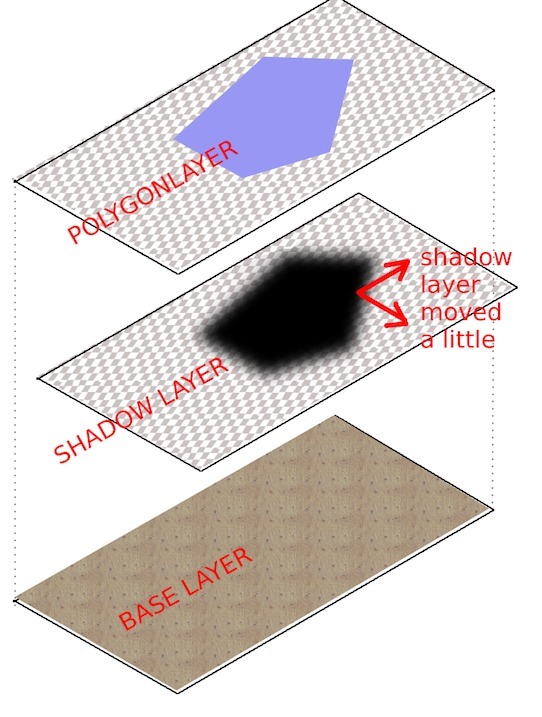 about your second video "Gimp polygon shadow...."
it starteed with the polygons already done, i know it is about shadow... but would be nice to show how you did it. you did it twice path or you duplicate them, if you duplicate them how did you moved the second so its not over the first one? Quote: ..about your second video "Gimp polygon shadow...."
I do not know how to explain to you any better, it is as ofnuts described earlier. 3. That second layer is blurred for a shadow effect. 4. That second layer is moved a little to give a shadow effect for the top layer. You will just have to watch the video again, it is there. Quote: line with edges that forma polygon in other words, edges, how you do that, i know how to do it (paint along the path... but)..the dialog box does not even let me choose color it forces you to choose the color BEFORE to hit "paint along the path" it should have a color option within the dialog box..
You get what is there, no good complaining about it here, so no whining. Quote: ..you did it twice path or you duplicate them, if you duplicate them how did you moved the second so its not over the first one?.. I made a path so that I could get a selection when I wanted it. Not needed because both the polygon and drop shadow are in the same place. Then I moved the layer a little to give the drop shadow effect. Watch the video again.